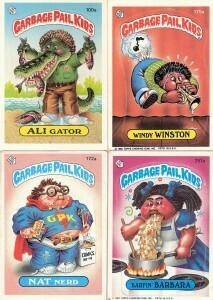 If you were a child growing up in the mid 1980s, you will definitely be familiar with Garbage Pail Kids trading cards. These cards (which peeled off to become stickers) parodied the Cabbage Patch Dolls, which were also very popular in the 80s. Each card featured a cartoon version of the doll with some comical abnormality, and an equally funny name which related to their ‘condition’, written at the bottom of the card. 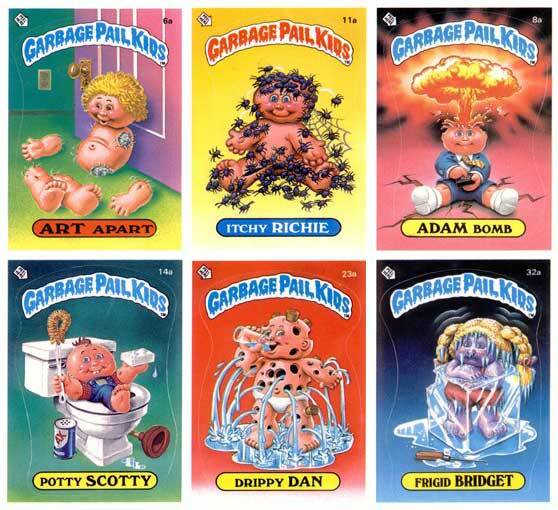 Although they were supposed to be light-hearted, some of the pictures were actually quite disturbing, but as a kid, the more disgusting something looked, the better, and these cards were one of the best things about the 80s, if you were a kid! The cards came in a pack of five with a stick of very hard pink bubblegum, and originally cost around 25p per pack. Produced by bubble gum manufacturers Topps Company, there have had a whopping 23 series since their 1985 debut (although most of the latter series were only released in the US). In 1988, three years after they first came out, their popularity started to wane. This might have had something to do with the fact that Topps were sued by the makers of Cabbage Patch Kids for trademark infringement. As part of the out-of-court settlement, they agreed to change the appearance of the Garbage Pail Kids to remove any similarities between the cards and the dolls. A lot of original fans stopped buying them around that time, including me, as they just didn’t look as good. But there was still a market for them and the Topps Company continued to produce them (on-and-off) over the years. The company recently announced a new flashback set which will be out in February 2010. This series will reportedly include all the old favourites and some new never-before-seen characters. The cards were originally the brainchild of Topps consultant and Pulitzer Prize-winning cartoonist Art Spiegelman. 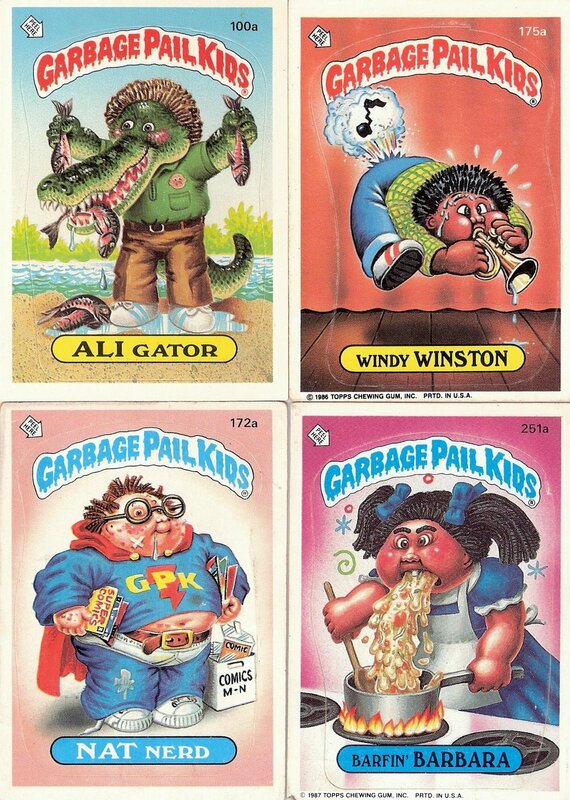 The cards were so popular that in 1997 a film titled Garbage Pail Kids was released, unfortunately it bombed at the box office. SINDY VS BARBIE- who were you reppin’? Hiya, I am really glad I have found this information. Today bloggers publish only about gossips and internet and this is actually irritating. A good web site with interesting content, that’s what I need. Thanks for keeping this web site, I’ll be visiting it. Do you do newsletters? Can not find it. [WORDPRESS HASHCASH] The poster sent us ’473975712 which is not a hashcash value. Hi. I needed to drop you a quick note to impart my thanks. I’ve been observing your blog for a month or so and have picked up a heap of effective information as well as relished the way you’ve structured your site. I am undertaking to run my own blog however I think its too general and I would like to focus more on smaller topics. I really liked the blog post. It’s always nice when you can not only be informed, but also entertained! After reading this I thought it was very informative. I appreciate you taking the time and effort to put this post together. Once again I find myself spending way to much time both reading and commenting. But so what, it was still worth it! I add it to my Facebook page. Is it ok for you Mr.? Sorry I do not know your real name, can not find it here. [WORDPRESS HASHCASH] The poster sent us ’0 which is not a hashcash value. [WORDPRESS HASHCASH] The poster sent us \’0 which is not a hashcash value. Thanks for your comments, please tell all your friends about this blog! Thanks so much for your comments! It means a lot to me, glad you enjoyed reading. And please do come back and tell all your friends as there is lots more in the pipeline. Nope, the facts are ones I found online and other research but all my own words. Thanks for the interesting topic. Tell your friends. That’s right I said! Author fellow. Nothing to add …. Wow, wonderful blog post! I even have shown this to my friends! Good work, keep us posting, you are very good writer.